This week's SmackDown Live is the third SmackDown after WWE Backlash 2018 on May 6, 2018! Press F5 or refresh for more updates during the show. Samoa Joe comes to the ring to open Smackdown, with the commentators reminding us that this is NOT his scheduled match time. He pulls a ladder out from under the ring and sets it up beneath both briefcases, then climbs up it and pulls down the briefcase. "It is said in biblical texts that the ladder represents the connection of the Earth to the heavens. It is said that, when Jacob climbed up on his ladder, angels descended from above, smiling and offering salvation. But in my version, it's quite different. There is no salvation, there are no angels smiling, although I'll be smiling, just like I am right now. Because I will climb up and grab the briefcase, and initiate a campaign of anxiety and fear on the WWE Champion that will shake this place to its very core. And tonight, I show Daniel Bryan that there are things far worse than forced retirement! In fact, if your tree-hugging, hippie sensibilities will allow it, I want you to hop on a cell phone to call your wife and have her tell your daughter a story. Tell her that daddy will be home for Money in the Bank, but he'll be a different man. His eyes will be drenched in regret and failure, and when she asks who did it, I hope you tell him that it was a very bad man, and his name was Samoa Joe." Bryan comes out. "Hold on, hold on. There are some lines you just don't cross, and I have a vision, it goes like this: you mention my wife or daughter one more time, and I break your leg. I think you know how it goes. We don't have to do this at the end of the night, we can go right now!" Big Cass comes out on a crutch. "Gentlemen, gentlemen, what are we doing here? Are we children. 'I'm gonna make fun of your family', 'Oh yeah? Well I'm gonna break your leg'. But what would I expect from the shrimp and the wimp? This should be my Money in the Bank spot, this second chance crap has got to stop. And it will. Because I spoke to General Manager Paige, and this match will not happen. What will happen is that Samoa Joe will take on yours truly for the final spot in the Money in the Bank ladder match, when I'm cleared. Good question. When am I cleared? I'm already cleared." Cass attacks Bryan with the crutch, Bryan ducks, Cass hits Joe, Bryan tees off on Cass, Cass tosses him into the ladder, clubs Joe with the briefcase, clubs Bryan with the briefcase, poses with it. Shinsuke Nakamura is walking around backstage with cards featuring the numbers 1-10. When he gets to ten, he rips it up. Still backstage, Paige tells a publicist to direct people to her. Absolution walk up and complain that Paige gave Asuka a title shot instead of them. Paige gives Mandy Rose a match with Asuka. Renee Young walks up and asks Paige about the main event. Paige says that she didn't realize that opening promo was going to happen, and Cass doesn't speak for her, and the match is a triple threat. Tye opens with a slap, Shinsuke with chops, whip, misses a kick, Tye with a chop, toss to the corner, chop, ten-punch, both men to the floor, Shinsuke with a punch on the floor, kick, rolls Tye into the ring, Tye with a dropkick, suicide dive, blocked with a kick, commercial. 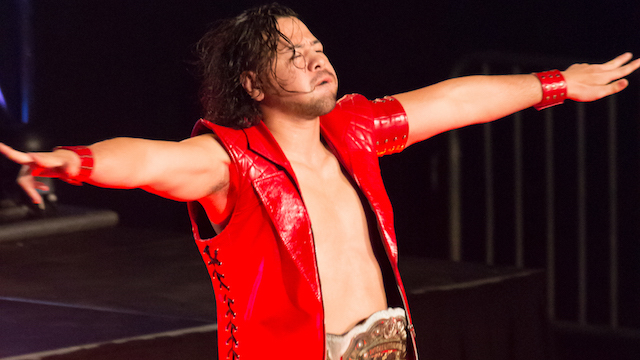 Back on air, Shinsuke has Tye in a chinlock, Tye breaks with a Stunner, goes off the ropes, Shinsuke with a knee lift, boots to the gut, scissor kick, starts counting to 10, Tye is up at 6, Shinsuke with a punch to the gut, knees, sets Tye up top sideways, running knee to the gut, starts counting, Tye gets up at 9, taunts, ducks a clothesline, mocks Shinsuke's taunt, hits a pair of punches, chop, Shinsuke with knees, Tye with a clothesline, knee jawbreaker, Shinsuke rolls to the apron, kick, second rope knee, Kinshasa for three. After the match, he hits a second Kinshasa, then counts to 10. Backstage, Dasha Fuentes asks AJ Styles about what just happened. AJ says he hasn't forgotten last week. He says Shinsuke has snapped, and there must be some reason for it, and now he's chosen a stipulation that favours him as a striker. But he says he became champion by his opponents thinking they have the advantage. Aiden English and Rusev sing Lana to the ring. Lana and Naomi come to the ring for a dance-off. Naomi comes out with The Usos. Lana starts off doing a relatively mediocre routine to a "Get Lucky" knock-off. Naomi does her usual thing to a "Turn Down For What" knock-off. Lana offers a handshake, Naomi takes it, they do a similarly mediocre routine together to the same TDFW knock-off, then Lana hits her with a neckbreaker. A brawl breaks out, The Usos and Naomi clear the ring, ending with a Rear View for Lana. Cesaro and Big E start off, E blocks a kick, belly to belly for two, Woods in, clothesline, Kofi with a kick, Woods with a leg drop, Kofi with a springboard splash, tags in for two, Cesaro whips Kofi to the corner, punches, toss him to the floor, triple team, commercial. Back on air, Kofi kicks out of a Miz cover at 2, Sheamus in, running boot, keylock, tosses Kofi to the corner, Cesaro in, clothesline for two, Sheamus in, elbow to Woods, Cesaro in, Hart Attack elbow for two, whip to the corner, charges, Kofi presses him to the floor, tosses Miz to the floor, Cesaro slides in, Miz grabs Bit E's leg, E stalks Miz on the floor, punches Sheamus, Cesaro with a baseball slide, Sheamus tosses E to the barricade, Kofi with a rollup for two, choke in the ropes, Sheamus with a boot, Miz in, Skull Crushing Finale, reversed into an SOS, Sheamus in, Woods in, punch to Cesaro, mixed strikes to Sheamus, head scissors, enziguri to Miz, blocks a back suplex from Sheamus, tosses him into the ring post, suicide dive to Cesaro, tornado DDT through the ropes to Sheamus for two, goes up top, Miz with a distraction, Sheamus crotches Woods, Kofi with a leaping clothesline to Miz from the apron, Cesaro takes him out, tags in, double team for two, Neutralizer, blocked, Cesaro lands on his feet, E in, uranage/backstabber combo for two, Miz in, Cesaro with a knee, Miz with a kneeling DDT for two, Kofi breaks the count, brawl breaks out, Woods gets dropped across the barricade by The Bar, Kofi goes up top, suicide dive to The Bar, Big Ending to Miz for three. Backstage, during an interview, Gallows and Anderson say they buried the hatchet with The Usos, and they know they have a tough task ahead of them. The Bludgeon Brothers come across a nearby screen and promise devastation. Sonya Deville attacks Asuka on her way to the ring. Asuka makes it to the ring anyway and the bell rings. Mandy presses Asuka to the corner, shoulder tackles, forearm, stomps, Asuka misses a chop, hits kicks, Mandy blocks one and hits a back suplex for two, covers again for two, straightjacket hold, chop, running knee lift for two, commercial. Back on air, trading shots, Asuka with mixed strikes, roundhouse kick, elevated knee lift, clothesline, missile dropkick for two, rollup for two, reversed into a rollup for two, Asuka Lock, Mandy taps. Carmella comes in the ring and poses with her championship. Backstage, Charlotte and Becky are watching. Charlotte suggests that Asuka will win the title and Charlotte will win the contract, setting up a rematch. Becky suggests that she will win instead and says it needs to be every woman for herself. Charlotte says she wants Becky to win, but needs to win herself more. Paige walks in and says she likes the competitive spirit and it reminds her of Team PCB. She says she has an idea, and it's "tea time", but then walks off without elaborating. After a commercial, they reveal that she meant Becky vs. Charlotte next week. Sin Cara finds Andrade backstage and welcomes him to Smackdown. Zelina says he doesn't really know Andrade despite Sin Cara's assertion that they go way back, and Andrade tells him not to touch him again. Bryan goes after Cass, Joe pulls him off and goes after Cass himself, they stomp him in unison, choke him in unison, whip, double team elbow, Joe with a chop to Bryan, snapmare, kick to the back, stomps, whip to the corner, chop, another chop, whip, Bryan floats over, baseball slide to Big Cass, Joe with a clothesline to Bryan, suicide dive to Cass, commercial. Back on air, Cass is punching away at Joe, misses an avalanche, Joe with an elbow, Pele kick, Coquina Clutch, Bryan breaks the count, but gets caught for an inverted atomic drop from Joe, follows up with a boot, senton for two as Cass breaks the count at the same time Bryan kicks out on his own, Joe with a headbutt, chop to Cass, punches in the corner, Cass with a chop, Bryan with a punch to Cass, toss to the corner, roundhouse kicks, Cass tosses him to the floor, then over the announce table, boot, Joe goes up top, both opponents knock him off, Bryan boots Cass, running dropkicks to Joe in the corner, Cass clotheslines Bryan for two, mounted punches, elbow drop, more mounted punches, foot choke, Bryan with kicks, punches, Cass with a knee lift, commercial. Back on air, Joe is chopping away at Cass, Cass with a punch, chop, punch to the back, Joe with a chop, punches, Cass with a spinebuster, Empire Elbow, Bryan breaks a cover at one, roundhouse kicks to Cass, Cass responds with an East River Crossing for two as Joe breaks the count, Cass with punches to Joe, Bryan with a European uppercut to Cass, dragon screw, one for Joe, roundhouse kicks to both men, hits a final kick on both men, covers Cass for two, punch to Cass, dragon screw, holds on to the leg, Joe locks in a Coquina Clutch on Bryan, who reverses into a rollup for two, tosses Joe to the floor, Big Cass rises behind him, misses a big boot, Bryan goes for the Yes Lock, slowly locks it in, can't quite get it, locks it in, Joe pulls Bryan out of the ring, Bryan with a boot, running knee to Joe, goes up top, missile dropkick to Cass, kip up, running knee to Cass for two as Joe breaks the count and locks Bryan in the Coquina Clutch, Bryan struggles but ultimately passes out. Joe celebrates and leaves, then Cass floors Bryan with a big boot and poses as Smackdown goes off the air.